As we all know, nutrition plays a vital role in maintaining health and longevity in people and our animal friends. 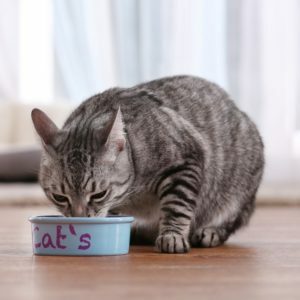 I am often asked, “What is the best food for my cat?” The “best” food would be what they would eat naturally: small rodents, lizards, birds and insects. Realistically, this is just not an option for our indoor feline friends. The next best thing is a home prepared diet formulated by a veterinary nutritionist that meets your cat’s particular dietary needs at his or her current life stage, activity level, health status, etc. Like most people though, I love my cat but just do not have the time or motivation to cook for him on a regular basis. However, if this is an option for you, there are several websites available that can formulate a recipe for you (BalanceIT.com is the most popular, but there are others). The most convenient form of feeding is a commercially prepared food, of which there are several varieties: canned, dry, semi-moist, and raw. Of these choices, most cats today are fed dry food, as it is the most convenient and has long been pushed as “ideal” for a cat’s health. My own cats ate dry food exclusively for years. However, as we learn more about feline nutrition and metabolism, there is more and more evidence that dry food is the last thing they need. Now, we all know of those cats that have lived a long, disease-free life on nothing other than dry food. I also know of a few people that lived into their 80’s and 90’s while smoking a pack a day for most of their life, but I still wouldn’t recommend it! So, why the dry food push for so long? It is only relatively recently that cats have been living strictly indoor lives. Until this happened, there wasn’t a need for a commercially prepared food, so little real research was done. In the beginning, nutritionally speaking, cats were basically viewed as small dogs and fed similar based diets, and they seemed to do fine. The problem is diet-related diseases can take years to actually show themselves. For example, even into the late 1980’s, cats were dying from heart disease related to taurine deficiency. Taurine is an amino acid that comes from meat, and unlike other species, cats cannot produce this themselves. Since then, more and more research has been put into feline nutrition. Today, you are unlikely to find any commercial food for cats that does not contain added taurine. CatInfo.org – lots of useful information on how to properly feed your cat. Food Puzzles for Cats – these puzzles help slow down cats that eat too fast. It also helps with boredom and environmental stresses.